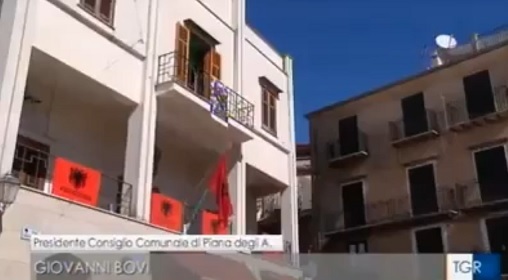 The Italian public Tlevizioni Rai 3 conducted a documentary relating to the match that will take place between Italy and Albania. This match will be played tomorrow at 20:45 at the Stadium "Renzo Barbera", Palermo. This documentary speaks about the fans of the Albanian national ffotball team who although born and raised in Sicily have not forgotten their strong Albanian roots, also Arberesh. The Arberesh have migrated to Italy more than 500 years ago to save their faith and life after the death of Skanderbeg when Albania was invaded by the Ottomans. "A halve of my heart is for Albania and the other half is for Italy," says a little girl from an Arberesh school in Sicily. "I'll be present in the guest section of the stadium, and I hope Albania will win," says the young boy in the interview. "Our origin is Albanian, we are Albanian," say an old man. This match is expected to gather thousands of Albanian fans in front of the television screen and in the stadium "Renzo Barbera".